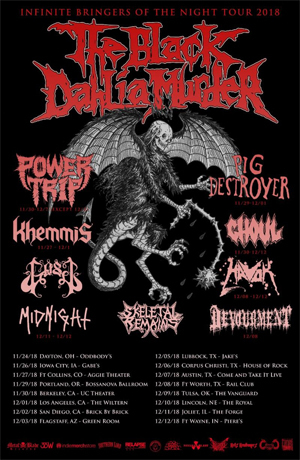 This November/December, THE BLACK DAHLIA MURDER will continue its support of their Nightbringers album with a new round of tour dates. The run will include a stop at the inaugural Los Angeles version of Decibel Magazine's Metal and Beer Fest. Support along the way comes from friends in POWERR TRIP, PIG DESTROYER, GHOUL, MIDNIGHT, KHEMMIS, GOST, SKELETAL REMAINS, DEVOURMENT, and HAVOK.